1. 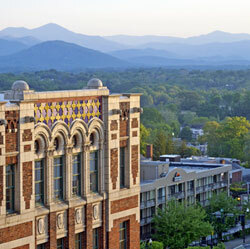 Asheville, N.C. Asheville (in photo) brings together the old and the new, with a strong history in Appalachian traditions and a new explosion of arts, food and beverages. There are cultural opportunities galore. And Asheville’s location off the Blue Ridge Parkway puts it right in the middle of stunning scenery, giving you access to a wide variety of outdoor activities. 2. Western Washington State. The cult TV favorite “Twin Peaks,” set in western Washington, has a planned return in 2017. But any time is a good time to check out the beautiful scenery that features lush greenery and mountains. If you are looking for an urban fix, check out Seattle, with its many music, dining and imbibing opportunities. 3. Lincoln, Neb. Lincoln is 150 years old in 2017, and it is throwing a year-long party with festivals and celebrations throughout the year. As both the state capital and home to the University of Nebraska, Lincoln has something for just about everyone. There also are miles of cycling trails and, if that leaves you hungry and thirsty, there are plenty of places to eat and drink. 4. California’s Low Desert. In places like the Coachella Valley and Palm Springs, hipsters and artists are rediscovering the retro charms that once drew the Rat Pack, that ultra-cool group that included Frank Sinatra, Dean Martin and Sammy Davis Jr. There are also some incredible parks, including Joshua Tree and Anza-Borrego Desert State Park, at 938 square miles the largest state park outside Alaska. 5. Montana’s Flathead Valley. The centerpiece is Glacier National Park, with its spectacular mountains, gorgeous lakes and, of course, glaciers. The area offers many other opportunities for outdoor activities from biking to rafting to fly-fishing to skiing. Or spend some time on a working dude ranch. Rounding out the top 10 destinations are Atlanta, the Adirondack Mountains, the Texas Hill Country wine region, Denver and Florida’s Emerald Coast, which stretches along the Panhandle from Pensacola to Panama City.